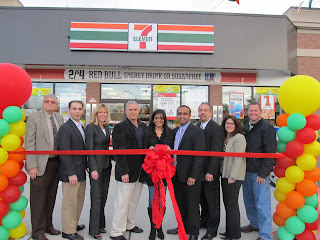 7-Eleven managers at the grand opening. Commuters passing through Pequannock Township will have a new place to stop for coffee on their daily trek to the workplace now that 7-Eleven has opened its doors. Standing on the corner of the A&P shopping plaza, Pequannock's new 7-Eleven brings a fresh face to a neighborhood where some stores are still shuttered post Irene. Boasting fresh produce, fresh baked goods, and a wide variety of coffee flavors, this 7-Eleven also brings a welcome influx of 12 new jobs (some part-time, some full-time), and has hired locally for several of those. 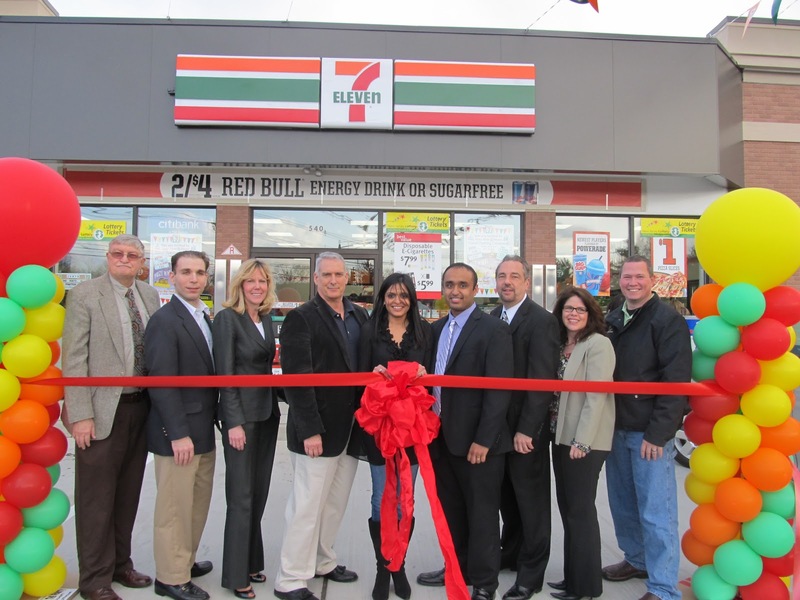 The opening event for 7-Eleven was well attended by both citizens and local government representatives including Mayor Phelan, Council-members Winterfield, Lynch, and Engelbart, and members of several Commissions including Ryan Herd and Christopher Lotito. A DJ played music while the "Red Bull Girls"and Monster Energy Drink guy gave out free samples. While a welcome consumer and economic feature, 7-Eleven also provides hope for other flooded commercial sites, as the building has been designed with flood proof barriers that can be slid into place in the event of a disaster. These flood prevention techniques will hopefully pave the way for wider adoption of flood proofing technologies, such as barriers and flood resistant building design throughout the community. While some have noted with concern the presence of several commuter oriented stores in a relatively small area, it's actually likely that the Dunkin Donuts and 7-Eleven will compliment each other due to their diversity in product offerings. Meanwhile, the Quik Check in Pequannock proper will remain a store widely patronized by local residents by virtue of both its fresh-made deli products and sandwiches, as well as ease of parking well away from the highway traffic.